When I first ran the Army Half Marathon in 2013, I got pwned. I made a couple of mistakes like drinking too much water during the run and stopping too long at a choke point, thus ended up with a nett time of 3 hours and 36 seconds. 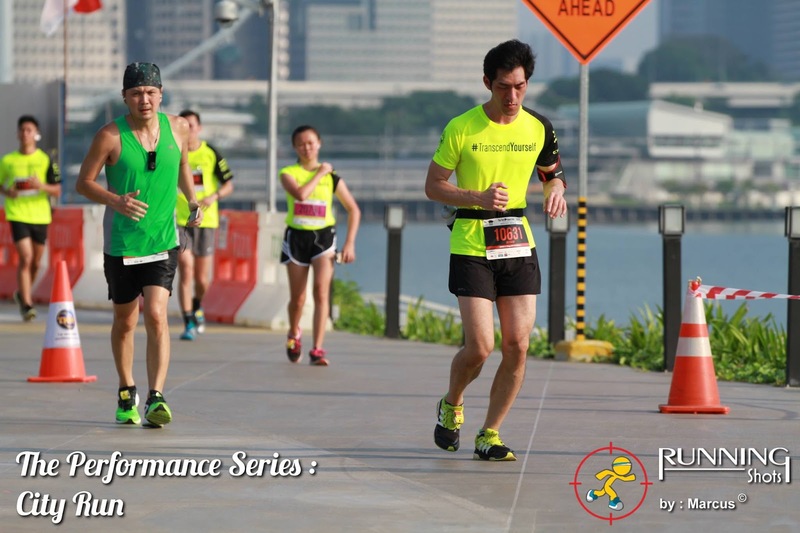 Last year, I improved to 2h 42m 16s at the 2XU Compression Run. After that, I was done with half marathons because they were simply too hard. I just stuck to mostly 10k races. But the registration fee for this year's Army Half Marathon was too cheap to pass up. It was only $13 for early birds. I was optimistic enough to aim for a time of two and a half hours. After all, I have changed so much as a runner since 2013. I'm more conscious of my form. I know more about shoes. I got more gear. 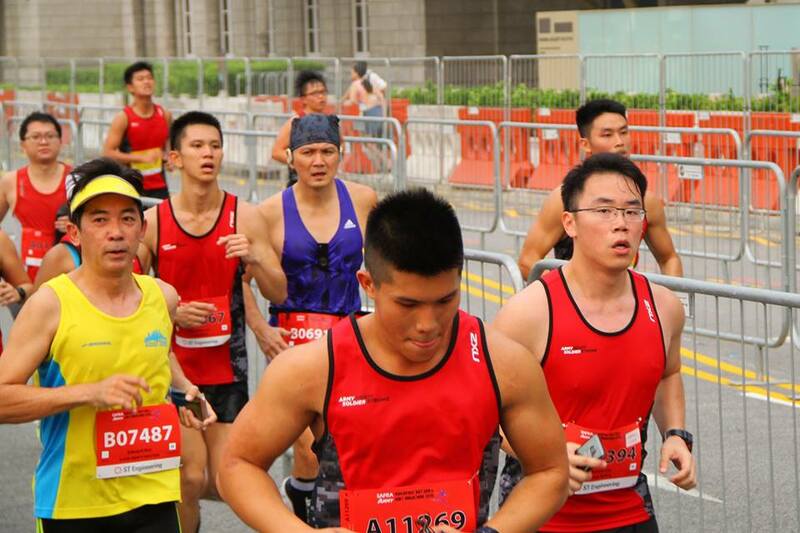 Remembering how I felt weighed down by my sweat-soaked clothes during my first AHM, I bought the super-light Adidas Adizero running singlet and super-short Nike running shorts. I found the perfect running shoes in the Under Armour SpeedForm Gemini. So light, so cushioned and so comfortable that I wore them without socks. 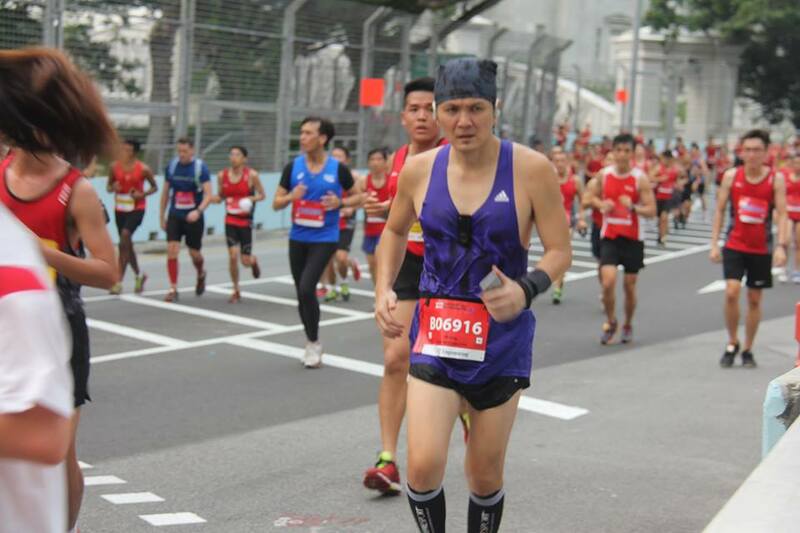 I also wore my Compressport calf sleeves, mostly to protect my ankle from being scrapped by the heels of my own shoes. Flag-off was at 5am yesterday. 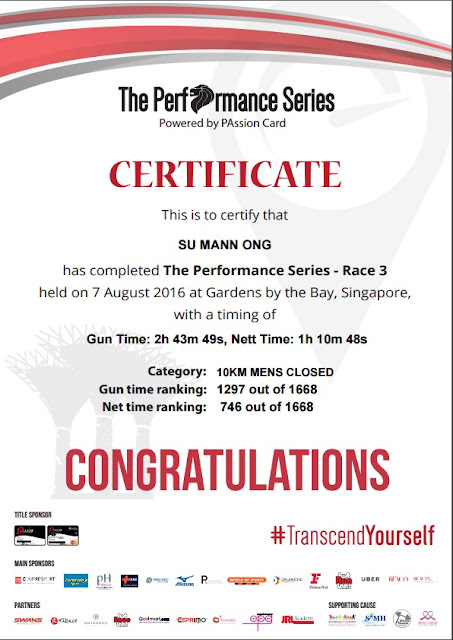 Once again, I worked the night before and took a taxi straight from the office to the race. But despite not getting any sleep at all, I felt great. Two and half hours seemed doable. I even caught a few Pokemon (plus a guy with Dragon Ball hair) along the way. I was enjoying myself. When the 2h 20m pacers ran past me with their balloons, I thought never mind. I would start worrying only when the 2h 30m pacers overtake me. And that happened after 15km on Nicoll Highway, but I still believed I could catch up to them and make my target time. Then came the U-turn on Republic Avenue. I still remember this stretch of road from my last AHM. This was the part of the course that broke me three years ago. And yesterday, it broke me again. I had lost sight of the balloons of the 2h 30m pacers ahead of me and any hope of catching up to them. And then the unimaginable happened - the 2h 40m pacers overtook me. This meant I wouldn't even be able to beat my previous time of 2h 42m! Just as in my previous half marathons, I was jogging so slowly that the walkers were overtaking me. It was over. I was done. I got pwned by the AHM again. But I told myself, no matter how slow and tired I was, I would not walk the remaining few kilometres. And so I struggled to the finish line. My official nett time was 2h 52m 56s. I have never felt more disillusioned after a race. I started to question my self-identification as a runner. All the money I spent on shoes and running gear. All the reading up on running. All the actual running. 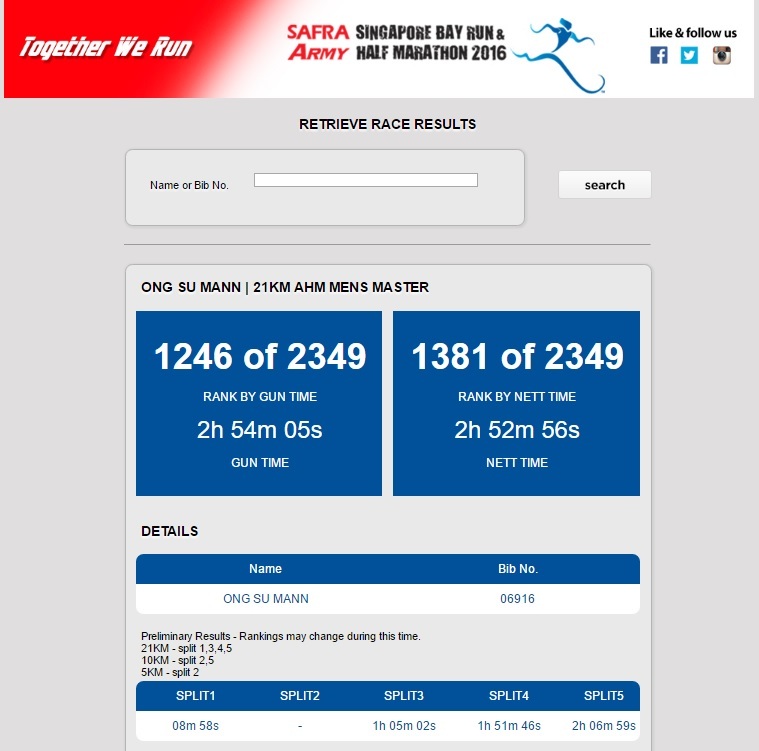 Finishing the Urbanathlon, aquathlons and all those trail runs meant nothing when I can't even run 21km in two and a half hours. 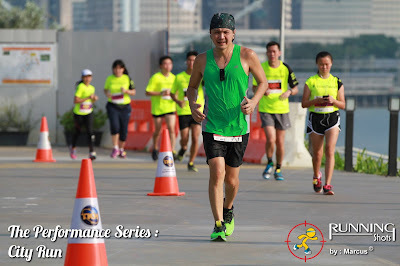 My one excuse is that a small muscle ache in my right buttock due to a new exercise I did last week acted up late in the race, which resulted in the cramp. I also find it curious that my running apps recorded a variety of distances longer than 21km, all the way up to 23.8km. 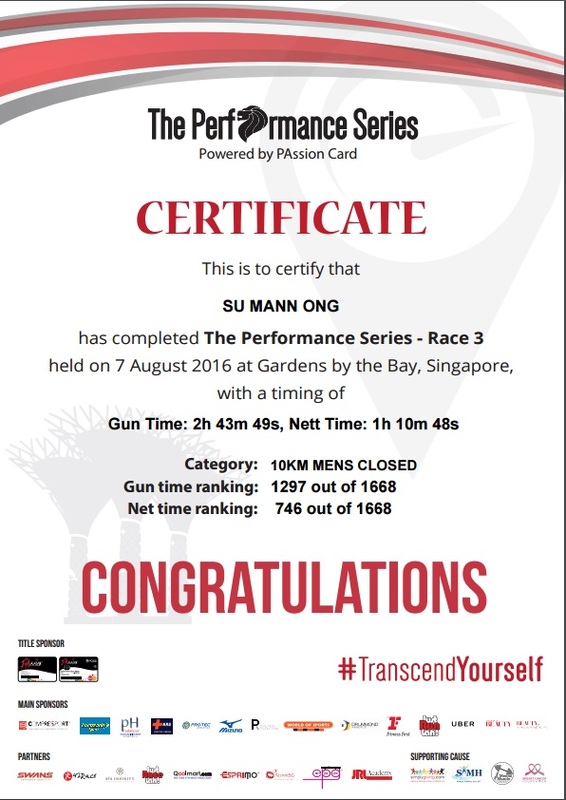 Does this mean I wasn't as bad as the official timing may suggest? The only way to find out is to run another half marathon. Guess I have a new goal in life. Still hazy after all these years: Where's our 11 months of 'nice air', Indonesia? Hello, haze, my old frenemy. I’ve come to talk with you again. Is it really you or just smoke from the Hungry Ghost Festival? No, it’s you. You have a distinct odour. 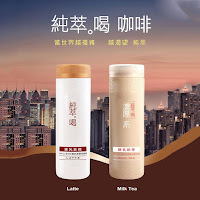 How about that popular Taiwanese milk tea, Chun Cui He? No, wait, it has been recalled. The Straits Times reported that the product could be available in Singapore again after more than a year.You could come and visit us again then. As you may or may not have noticed, people aren’t very happy to see you. Actually, it’s more like because of you, people can’t see very much of anything. And you do stink up the place. Again, no offence. Maybe you can try a new deodorant or breath mints or something. It’s not a good sign when we can smell you before we can see you. And you look, uh, as hazy as usual. 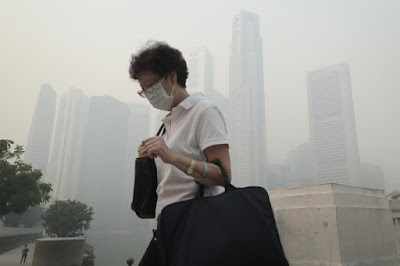 The last time the PSI was in the unhealthy range was October last year. It’s August now. So that makes it 10 months. 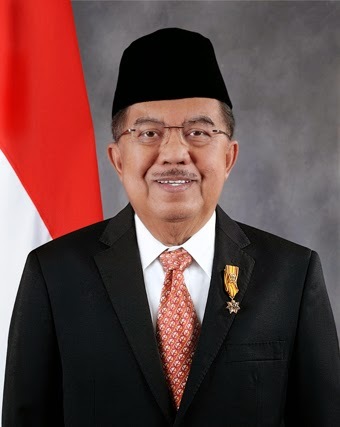 Hey, I thought the Indonesian vice-president said we get 11 months. So he owes us one month. 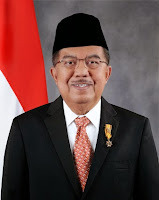 Now I regret going to the website at thankyouindoforthecleanair.com to thank Indonesia for “11 months of clean air”. But since you’re here, that gives a chance to catch up. How long have we known each other now? How many years? That’s from a Straits Times article. Guess when it was published. My favourite song that year was Me And Julio Down By The Schoolyard by Paul Simon, who once wrote a song called A Hazy Shade Of Winter. 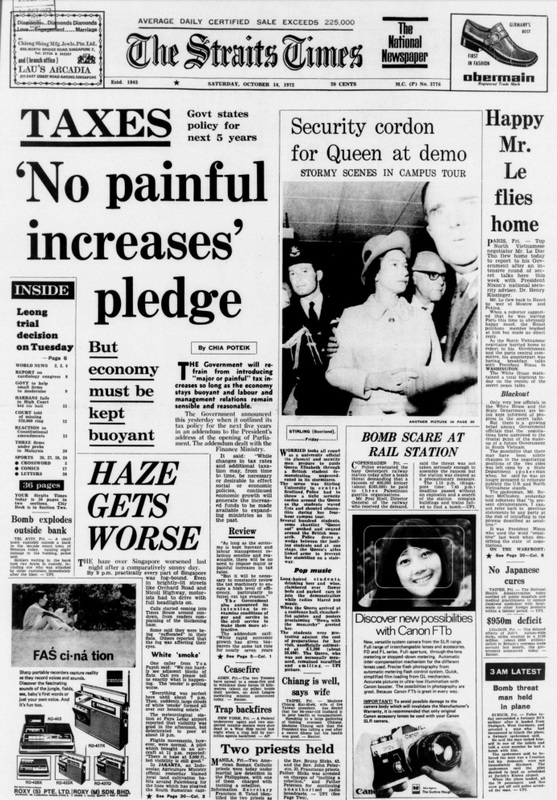 Even though the article could have been written today (well, maybe except for the Paya Lebar airport part), it actually came out on Oct 14, 1972. More than four decades ago. My god. How young were we back then? We had never even heard of PSI. The only mask I wore was when I played Zorro. We didn’t even celebrate Halloween back then. We were so backward. 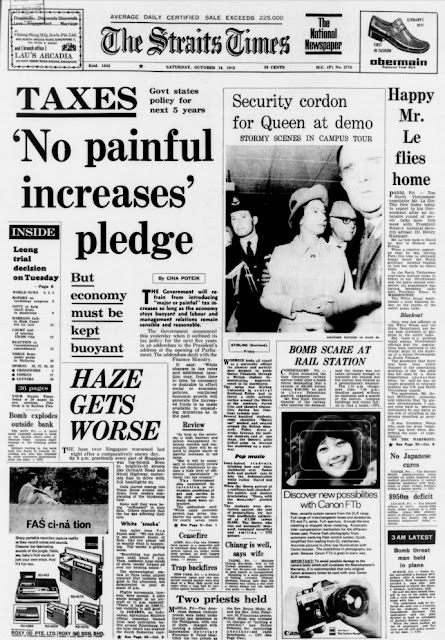 But Singapore has come a long way since 1972. We now have an airport at Changi. 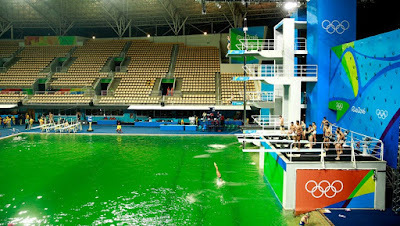 We have even won a gold medal at the Olympics. If you had shown up two weeks earlier, you could have caught Joseph Schooling’s victory parade. On second thought, it’s a good thing you didn’t. We have already given him a deferment for his national service so that he can win more medals for us. We don’t want you making him sick. 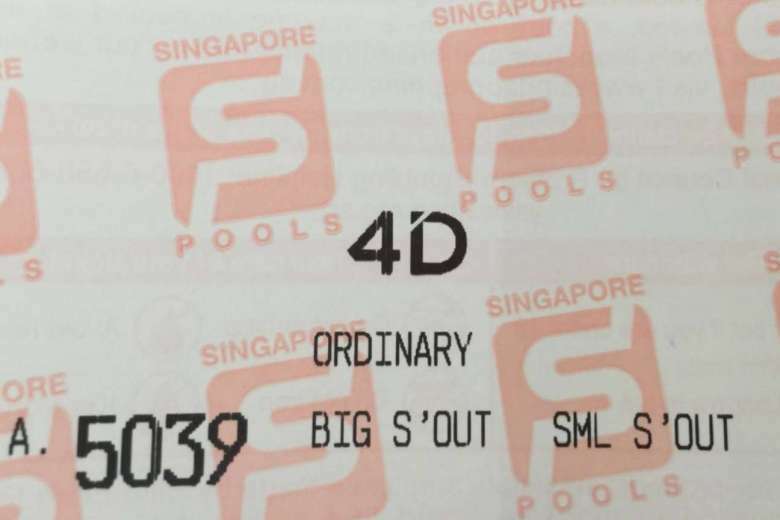 But for all the advancements Singapore has made in those 44 years, we still can’t get rid of you for good — and by the looks of it, probably never will. Hey, we used to think we would never win an Olympic gold medal too. So we can still dream. And if we ever do see the last of you, there would be a parade surpassing even the one for Schooling. We would even put Mr Kalla on the open-top bus. So don’t say we never thank Indonesia. But alas, I probably will see you again next year. It just better not be in less than 11 months. 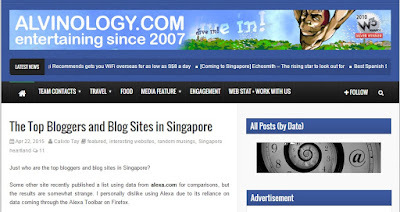 This is a follow-up to a blog post I wrote a year ago, re-ranking the top 25 blogs listed by Alvinology. 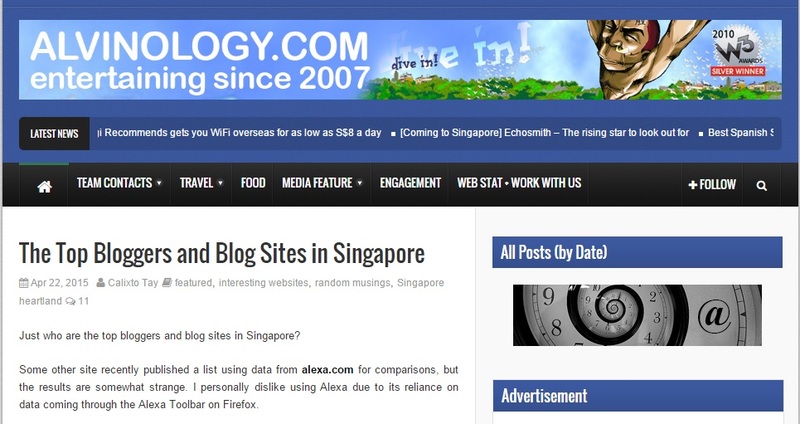 But that list was puzzling in terms of what Alvinology counted and didn't count as "blogs". So this time I decided to expand it considerably to include what I think are noteworthy local blogs and websites, which admittedly may also be somewhat arbitrary. 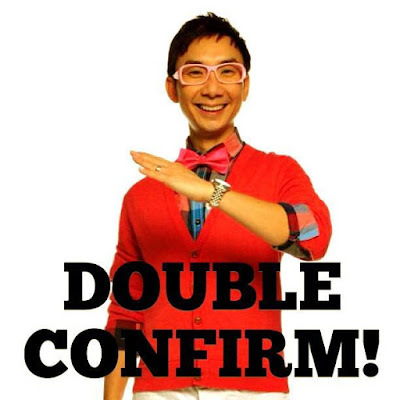 But hey, Alvinology started it first. As before, the data is from Similar Web. This list is by no means comprehensive or definitive. If there is any blog or website you think should be included but isn't here, let me know. I decided the cut-off would be 30k visits. If a website had fewer than 30k visits last month, it won't be listed here. Sorry, Eunice Annabel (29.6K). That also leaves out my own blog, which had only 8.20K. 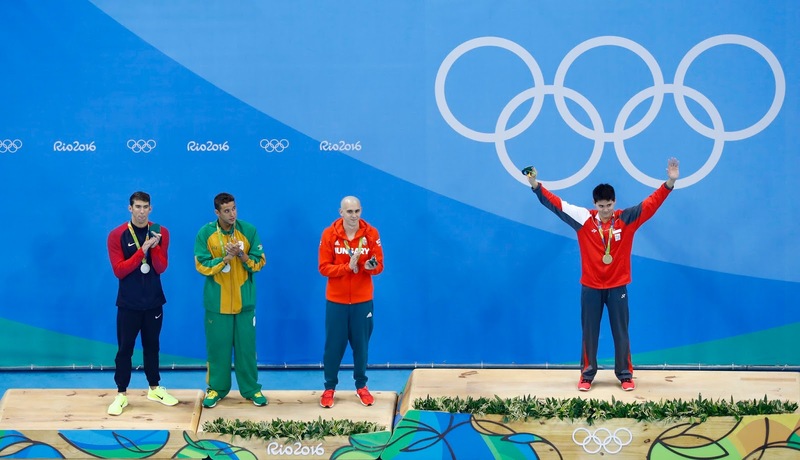 When it was announced last week that a victory parade for Singapore’s first Olympic gold medalist Joseph Schooling would be held, some were quick to criticise the move as insensitive to Singaporeans who were still competing in Rio. 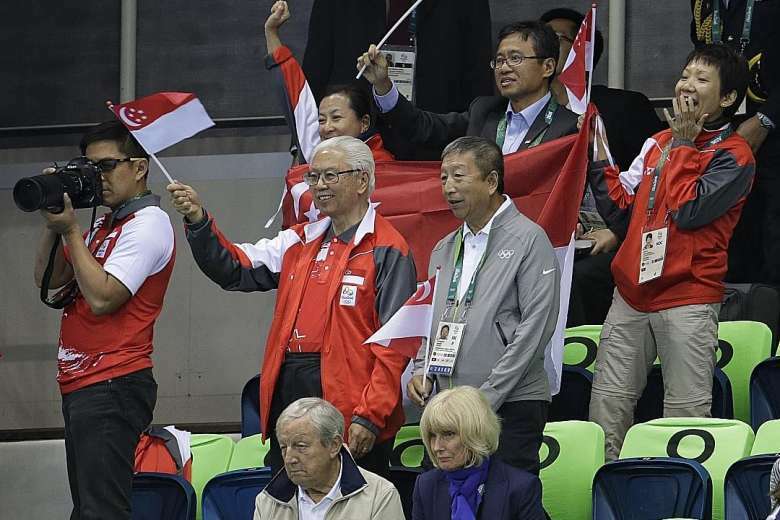 “Why don’t they wait for all the Singaporean Olympic athletes to return then do it together? 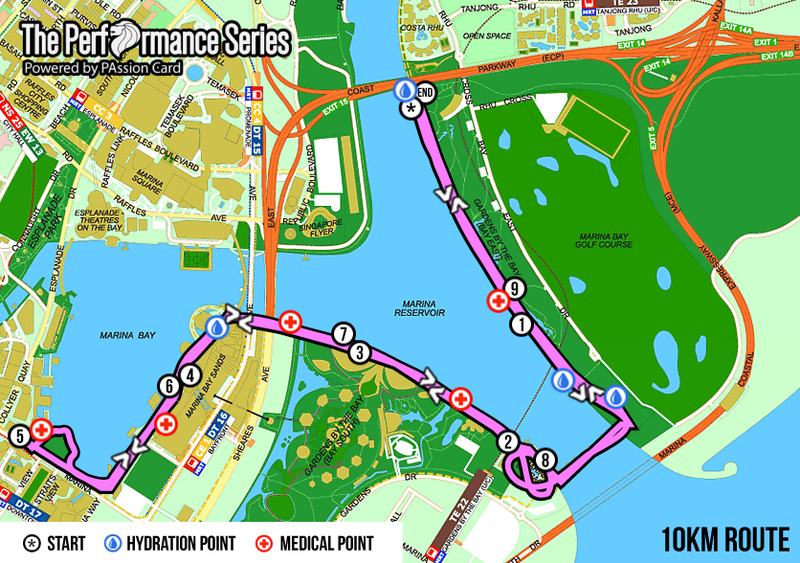 They did not put in any less effort to compete for Singapore. But did many care? Not the thousands who thronged the parade route and pit stops such that crowd control became a problem. 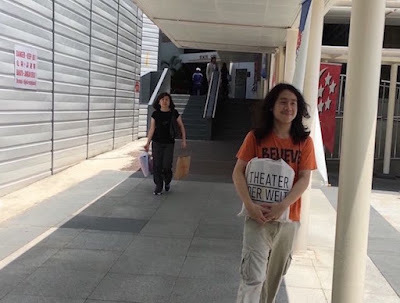 “My kids and I were there and we left angrily. There were many kids standing at the front and the adults were the ones pushing everyone. And you thought the Pokemon Go crowds were crazy. Even Schooling couldn’t manage more than a mouthful of his beloved fried carrot cake because of the mob. So much left over! It would have been a waste to just throw the food away. Did anyone eat it and maybe have a taste of his DNA? As for the parade itself, which had Schooling on an open-top double-decker bus, it caused two road accidents and Schooling confessed to being responsible for one of them. “So this lady tries to get her kids to wave at me and she has her steering wheel turned towards the bus. So when the bus starts moving, she gasses it and her car goes straight into our bus and rams — T-bones our bus. Well, he does look pretty tasty. And this is why we can’t have nice things like a victory parade. 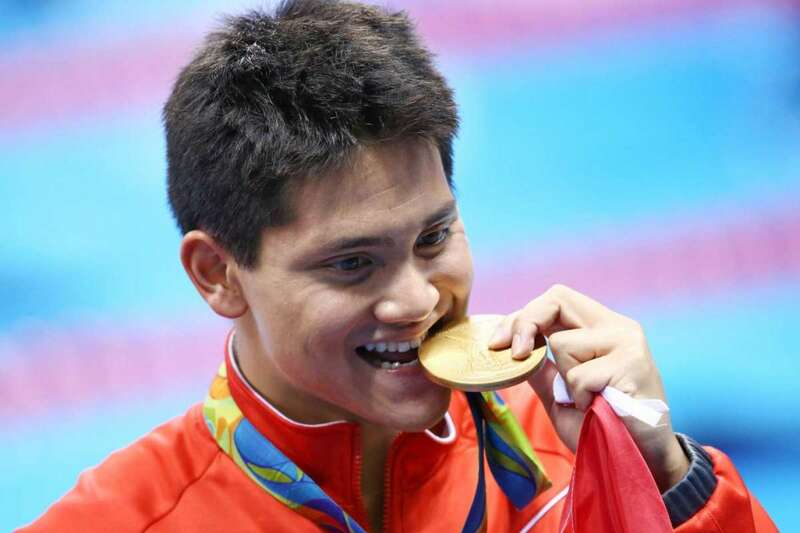 When on Monday, Parliament “moved a motion” to congratulate Schooling, it also had the chance to move a motion to declare Thursday (or any other day) a public holiday to honour him even more. But it passed the Administration of Justice (Protection) Bill instead. Safe to say, more people would have preferred a Let’s Have A National Holiday Because We Just Won Our First Olympic Gold Medal Bill. There wouldn’t be a seven-hour debate over that. Minister for Social and Family Development Tan Chuan-Jin probably spoiled the market by suggesting a National Schooling Day where “everyone will have to go to school” because he couldn’t resist the pun. And this is why we can’t have nice things like an extra public holiday. We can only envy Fiji, which did declare a public holiday after winning its first Olympic medal by beating Great Britain in the rugby sevens final to get the gold. That is, if we can find Fiji on the map. But even though we didn’t get a holiday, McDonald’s offered six free chicken McNuggets to the first 50 customers at all its outlets (excluding iFly, Resorts World Sentosa, Lido, Gardens by The Bay and institutional stores) on Monday from 11am. Why free McNuggets, you ask, and not, say, a free Fillet-O-Fish? Since, you know, Schooling swims like a fish. According to McDonald’s, it was “to celebrate our hero and golden boy Joseph Schooling, on winning his own golden nugget at Rio”. So now you know why athletes bite their medals when they pose for photographs. Ummm… because the medals resemble chicken nuggets? They should start giving out curry sauce with those McMedals. Trouble is, McDonald’s and other companies promoting themselves while congratulating Schooling are not allowed to do this. “While we celebrate Joseph’s victory, we must also stand guided by the rules and guidelines protecting the assets and marks of the Games. And this is why we can’t have nice things like free McNuggets. Too bad the International Olympic Council isn’t as generous. 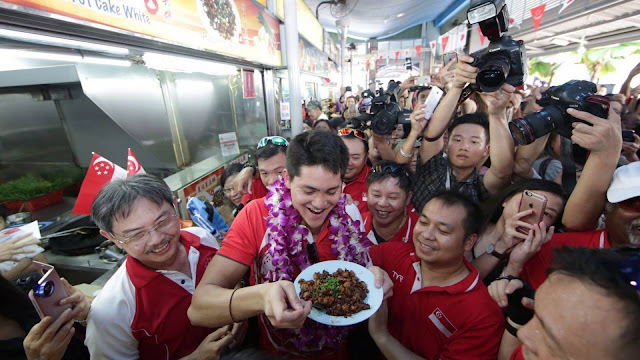 But on his part, Schooling has been true to his word, sharing the greatest moment of his life with all Singaporeans on the victory parade and elsewhere last week with a ready and winning smile. And that’s a nice thing we do have. So I saw this picture of Amos Yee outside the courthouse (again) today. After getting over his Tarzan hair, I was irritated by something else. I don't mean to scandalise the court, but how long has the hoarding been there? It has been there like forever. It was there when Yee was slapped last year. It was there when Roy Ngerng and gang went to court for "heckling" special needs kids at Hong Lim Park two years ago. It was there when the City Harvest trial started three years ago. What the hell are they constructing outside the courts and why is it taking so long? I was annoyed enough by the constant sight of the ugly hoarding to find the answer. Construction work on the new State Courts complex will commence in June, following the groundbreaking ceremony that was held on Wednesday. 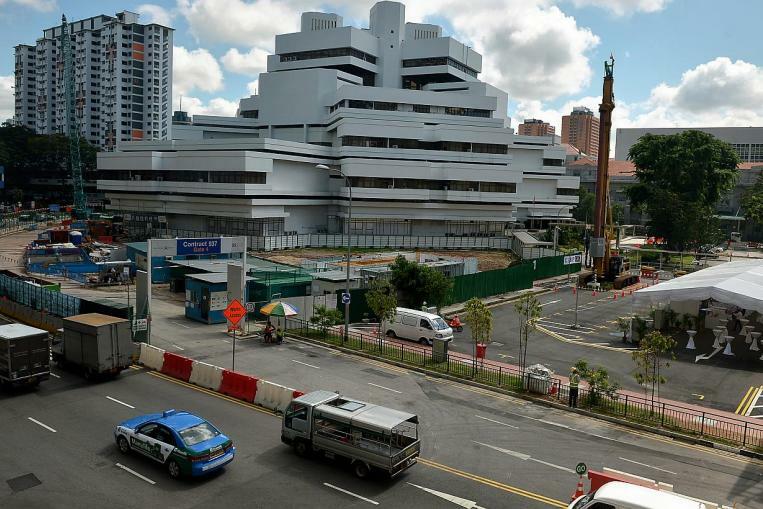 The new complex, consisting of two interconnected towers, will rise behind the existing octagonal-shaped courts building at the corner of Upper Cross Street and Havelock Road. It will expand the physical infrastructure of the State Courts without interrupting its day-to-day functioning, unlike an overhaul of the current building, said judicial commissioner See Kee Oon, who is the presiding judge of the State Courts. He also noted that the State Courts was handling a growing caseload, which means the need for more court rooms. The number of court rooms available for both civil and criminal cases will increase from 40 now to more than 60 when the new complex opens in 2019, while the number of hearing chambers will nearly double from 28 now to more than 50. In sum, the new complex will be three times larger than the current courts. Of the open frame design of the new complex, which will have no external enclosed facade, Chief Justice Sundaresh Menon, who officiated the ceremony, said: "This design intent aims to translate the vision of the State Courts, which is to inspire public trust and confidence through an effective and accessible justice system, into a physical representation. "Standing as a modern contrast to the 'octagon', the new tower complex... is a powerful metaphor for the openness, transparency and impartiality of the judicial process." How the current courthouse will be used from 2019 is currently under discussion, said a State Courts spokesman. It had been previously slated to house the civil, family and juvenile courts. The current courthouse, which has been in use for nearly 40 years, has already been marked for conservation. So now we know the reason for the backdrop behind Serina Wee. You know why I was so slow? Why did I stop for the stupid Zubat? If I dive in, will I get gangrene? Does he remember the words? Doesn’t that make him 50 per cent Malaysian? Should he be exempted from national service? But do I think a public holiday should be declared? How hopeless can I be? 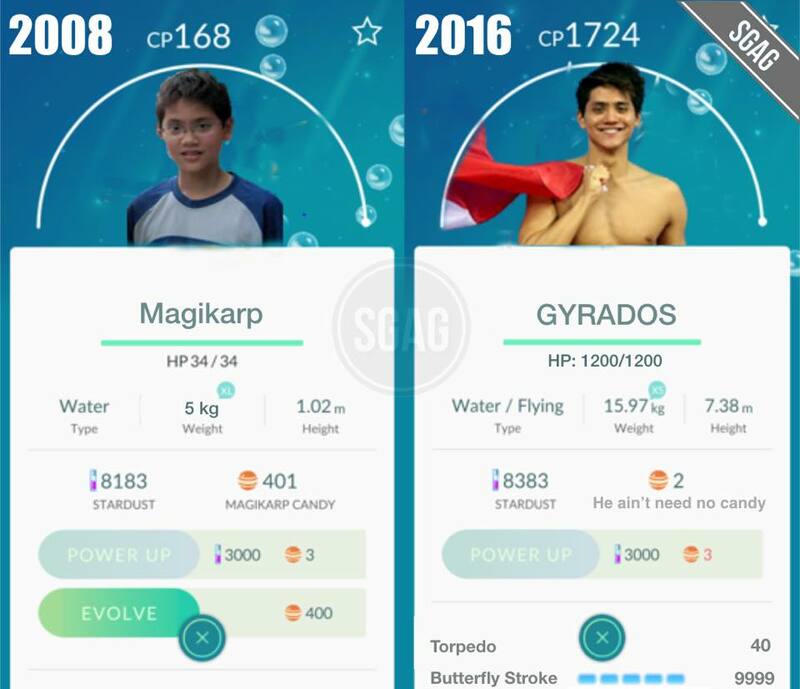 Does he play Pokemon Go too? I guess it's a National Day thing. The Today article references Dr Gwee Li Sui as expected. I predicted in May that "any discussion about the Government’s policy on Singlish will henceforth have to namecheck Dr Gwee Li Sui". The Time article doesn't mention Dr Gwee by name - but dredges up Phua Chu Kang. On top of all that, there's also this Jetstar thing.